The aggregate market value of W. R. Grace & Co. voting and non-voting common equity held by non-affiliates as of June 30, 2017 (the last business day of the registrant's most recently completed second fiscal quarter) based on the closing sale price of $72.01 as reported on the New York Stock Exchange was $4,876,308,803. At January 31, 2018, 67,693,241 shares of W. R. Grace & Co. Common Stock, $.01 par value per share, were outstanding. Portions of the definitive Proxy Statement to be delivered to our stockholders in connection with the Annual Meeting of Stockholders to be held on May 9, 2018, are incorporated by reference into Part III. GRACE®, the GRACE® logo and, except as otherwise indicated, the other trademarks, service marks or trade names used in the text of this Report are trademarks, service marks or trade names of operating units of W. R. Grace & Co. or its subsidiaries and/or affiliates. RESPONSIBLE CARE® is a trademark, registered in the United States and/or other countries, of the American Chemistry Council. UNIPOL® is a trademark of The Dow Chemical Company or an affiliated company of Dow. W. R. Grace & Co.–Conn. and/or its affiliates are licensed to use the UNIPOL® trademark in the area of polypropylene. Unless the context indicates otherwise, in this Report the terms "Grace," "we," "us," or "our" mean W. R. Grace & Co. and/or its consolidated subsidiaries and affiliates, and the term the "Company" means W. R. Grace & Co. Unless otherwise indicated, the contents of websites mentioned in this report are not incorporated by reference or otherwise made a part of this Report. The Financial Accounting Standards Board® is referred to in this Report as the "FASB." The FASB issues, among other things, the FASB Accounting Standards Codification® ("ASC") and Accounting Standards Updates ("ASU"). The U.S. Internal Revenue Service is referred to in this Report as the "IRS." W. R. Grace & Co. is engaged in the production and sale of specialty chemicals and specialty materials on a global basis through two reportable business segments: Grace Catalysts Technologies, which includes catalysts and related products and technologies used in refining, petrochemical and other chemical manufacturing applications; and Grace Materials Technologies, which includes specialty materials, including silica-based and silica-alumina-based materials, used in coatings, consumer, industrial, and pharmaceutical applications. We entered the specialty chemicals industry in 1954, the year in which we acquired the Davison Chemical Company. Grace is the successor to a company that began in 1854 and originally became a public company in 1953. W. R. Grace & Co. is a Delaware corporation. Our principal executive offices are located at 7500 Grace Drive, Columbia, Maryland 21044; website is at www.grace.com; and telephone is +1 410.531.4000. As of December 31, 2017, we had approximately 3,700 global employees. On January 27, 2016, Grace entered into a separation agreement with GCP Applied Technologies Inc., then a wholly-owned subsidiary of Grace ("GCP"), pursuant to which Grace agreed to transfer its Grace Construction Products operating segment and the packaging technologies business of its Grace Materials Technologies operating segment to GCP (the "Separation"). Grace and GCP completed the Separation on February 3, 2016 (the "Distribution Date"), by means of a pro rata distribution to the Company's stockholders of all of the outstanding shares of GCP common stock (the "Distribution"), with one share of GCP common stock distributed for each share of Company common stock held as of the close of business on January 27, 2016. As a result of the Distribution, GCP became an independent public company. GCP’s historical financial results through the Distribution Date are reflected in Grace’s Consolidated Financial Statements as discontinued operations. On June 30, 2016, we completed the acquisition of the assets of the BASF Polyolefin Catalysts business (the "polyolefin catalysts acquisition"), which included technologies, patents, trademarks, and production plants in Pasadena, Texas, and Tarragona, Spain, for a purchase price of $250.6 million. We added the following technologies to our catalysts portfolio: (1) LYNX® high-activity polyethylene ("PE") catalyst technologies used commercially in slurry processes for the production of high-density PE resins such as bimodal film and pipe, and (2) LYNX® polypropylene ("PP") catalyst technologies used commercially in all major PP process technologies including slurry, bulk loop, stirred gas, fluid gas, and stirred bulk. The acquisition also provided us with significant additional flexibility and capacity for our global polyolefin catalysts manufacturing network. In 2016, we exited certain Grace Materials Technologies product lines, as these product lines no longer fit into our strategic growth plans. We sold certain of these assets to unaffiliated buyers for aggregate proceeds of $12.9 million. On February 3, 2014, Grace concluded a voluntary reorganization under Chapter 11 of the United States Bankruptcy Code in the United States Bankruptcy Court for the District of Delaware, when the joint plan of reorganization (the "Joint Plan") filed by Grace and certain other parties became effective. On December 14, 2017, we signed a definitive agreement to acquire the polyolefin catalysts business of Albemarle Corporation for $416 million, subject to regulatory approvals and other customary closing conditions. This acquisition would be complementary to our Specialty Catalysts business and would strengthen our catalysts technology portfolio, commercial relationships, and manufacturing network. Fluid catalytic cracking catalysts - also called FCC catalysts, that help to "crack" the hydrocarbon chain in distilled crude oil to produce transportation fuels, such as gasoline and diesel fuels, and other petroleum-based products; FCC additives used to reduce sulfur in gasoline, maximize propylene production from refinery FCC units, and reduce emissions of sulfur oxides, nitrogen oxides and carbon monoxide from refinery FCC units; and Methanol-to-Olefins (MTO) catalysts, used to convert methanol, often derived from coal, into petrochemical feeds such as ethylene and propylene. Polyolefin catalysts and catalyst supports - also called specialty catalysts (SC), for the production of polypropylene and polyethylene thermoplastic resins, which can be customized to enhance the performance of a wide range of industrial and consumer end-use applications including high pressure pipe, geomembranes, food packaging, automotive parts, medical devices, and textiles; chemical catalysts used in a variety of industrial, environmental and consumer applications. Gas-phase polypropylene process technology - which provides our licensees with a cost-effective, flexible, and reliable capability to manufacture polypropylene products across a wide spectrum of performance attributes enabling customers to manufacture products for a broad array of end-use applications. Coatings - functional additives for wood and architectural coatings that provide surface effects and corrosion protection for metal substrates. Consumer/Pharma - specialized materials used as additives and intermediates for pharmaceuticals, nutraceuticals, beer, toothpaste, food and cosmetic segments. Chemical process - functional materials for use in plastics, rubber, tire, metal casting and adsorbent products for petrochemical and natural gas applications. We operate our business on a global scale with approximately 75% of our 2017 sales outside the United States. We operate and/or sell to customers in over 60 countries and in over 30 currencies. We manage our operating segments on a global basis, to serve global markets. Currency fluctuations affect our reported results of operations, cash flows, and financial position. invest in commercial excellence, which includes among other things, demonstrating the financial value of our products to the operations and end markets of our customers, managing our business development pipeline, and supporting our channel partners. Specialty chemicals and specialty materials are high value-added products used as catalysts, intermediates, components, protectants or additives in a wide variety of products and applications. They are generally produced in relatively small volumes (compared with commodity chemicals) and must satisfy well-defined performance requirements and specifications. Specialty chemicals and specialty materials are often critical components of end products, catalysts for the production of end products, and components used in end products. Consequently, they are tailored to meet customer needs, which generally results in close relationships with our customers. quality and reliability of product and supply. We believe that our focus on these competitive factors enables us to deliver significant value to customers at competitive prices and operating margins notwithstanding the increased customer service and research and development costs that this commitment entails. Catalysts Technologies principally applies alumina, zeolite and inorganic support technologies in the design and manufacture of products with the goal of creating significant value for our diverse customer base. Our customers include major oil refiners as well as plastics and chemicals manufacturers. We believe that our technological expertise provides a competitive advantage, allowing us to quickly design products that help our customers create value in their operations and their end markets. The following table sets forth Catalysts Technologies sales of similar products, technologies, and services as a percentage of Grace total revenue. The following table sets forth Catalysts Technologies sales by region as a percentage of Catalysts Technologies total revenue. We are a global leader in developing and manufacturing fluid catalytic cracking, or FCC, catalysts and additives that are designed to enable petroleum refiners to increase profits by improving product yields, value and quality. Our FCC products also enable refiners to reduce emissions from their FCC units and reduce sulfur content in the transportation fuels they produce. Oil refining is a highly specialized discipline and FCC catalysts must be tailored to meet local variations in crude oil feedstocks and a refinery's product mix. We work regularly with our customers to identify the most appropriate catalyst and additive formulations for their changing needs. Since our customers are refiners, our business is highly dependent on the economics of the petroleum refining industry. In particular, demand for our FCC products is affected by refinery throughput, the type and quality of refinery feedstocks, and the demand for transportation fuels and other refinery products, for example petrochemical feeds such as propylene. In general, as a refinery utilizes more of its FCC unit capacity, it needs a greater amount of FCC catalyst. Refinery throughput, or the extent to which refiners utilize their available FCC capacity, is generally determined by demand for transportation fuels and petrochemical products and the availability of crude oil supply. In recent years, global economic growth, especially in emerging regions, has increased global demand for transportation fuels and petrochemical products. Retail gasoline and diesel fuel prices and the level of economic activity has also directly influenced transportation fuel demand. Improvements in vehicular fuel economy, as well as consumer trends and government policies that increase the use of non-petroleum-based fuels and/or decrease the use of petroleum-based fuels also will affect transportation fuel demand over time. Refinery crude oil feedstocks vary in quality from light and sweet to heavy and sour. Light and sweet feedstocks are typically more expensive than heavy and sour feedstocks and yield a greater proportion of high-value petroleum products. They also yield a lower proportion of residual oil, or "resid," which is generally the lowest value component contained in crude oil. Although heavy and sour feedstocks with high resid content are typically less expensive than higher quality feedstocks, the processing of high-resid feedstocks is more difficult because these feedstocks have more impurities and higher boiling points. Heavy and sour crude oil has a relatively high level of metals, nitrogen and sulfur contamination. Our customers generally determine the feedstocks to be used in their refineries based on relative pricing and availability of various quality feedstocks. Refinery configuration and complexity also plays a role in feedstock selection; more complex refineries tend to process a higher proportion of heavy and sour feedstocks. In general, as a refinery uses more heavy and sour feedstocks, it uses a greater amount of FCC catalyst. In addition, refiners use special high value-added formulations of FCC catalysts for efficient refining of heavy and sour feedstocks. We have designed our MIDAS® catalyst, IMPACT® catalyst, NEKTOR™ catalyst, and GENESIS® catalyst product portfolios to enable our customers to increase the efficiency and yield of high-resid feedstock refining. Many countries and regions, including the U.S., European Union, Japan, Russia, India and China have imposed regulatory limitations on the sulfur content of gasoline and diesel fuel. We have developed a portfolio of products designed to assist refiners in meeting their gasoline sulfur-reduction targets, including our D-PRISM® and GSR® additives and our SURCA® catalyst family. Within certain limits, refiners have the ability to adjust their relative output of transportation fuels versus petrochemical feeds. Global economic growth, especially in emerging regions, has increased the demand for plastics at a faster rate than growth of transportation fuels. As a result, some of our refinery customers have sought increased profits from petrochemicals by increasing the yield of petrochemical feeds such as propylene from their FCC units. Our ZSM-5-based technologies, including our OLEFINSULTRA® additive products, are designed to maximize the propylene and butylene output of FCC units. Many U.S. petroleum refiners have entered into consent decrees with the U.S. Environmental Protection Agency (the "EPA") under which the refiners have agreed to reduce emissions of nitrogen oxides and sulfur oxides. The European Union has also imposed requirements on refineries with respect to nitrogen oxides and sulfur oxides emissions. FCC units are generally the largest emitters of these pollutants in a refinery. Our additives are designed to assist refineries in meeting their obligations to reduce these pollutants. Our Super DESOX® additive reduces sulfur oxides emissions from commercial FCC units. Our DENOX® additives are designed to achieve reductions in nitrogen oxides emissions comparable to those obtained from capital intensive alternatives available to a refinery, while our non-platinum-based combustion promoters XNOX® and CP®P are designed to enable refiners to control carbon monoxide emissions without increasing nitrogen oxides. Competition in FCC catalysts and additives is based on value delivered to refiners, which is derived from differentiated technology, catalyst performance, technical and customer service and price. Our principal global FCC catalyst competitors are Albemarle, BASF, and SINOPEC. Our principal global competitors in FCC additives are Johnson Matthey, Albemarle, and BASF. We also have multiple regional competitors for FCC catalysts and additives. An emerging market is developing for the conversion of methanol, either derived from coal gasification or from natural gas, into petrochemical feeds such as ethylene and propylene. This technology, known as Methanol-to-Olefins, or MTO, has created the need for an FCC-like catalyst for use in this processing unit. A number of MTO units have been constructed and are operating in China, with additional units in the planning and construction phases. Our MTO catalyst, GCQ™, was introduced in 2016 and has been used successfully in a number of customer MTO units. Competition is based on catalyst performance, technical service and price. Our primary competitors are UOP and Chia Tai. We market hydroprocessing catalysts primarily through ART, our joint venture with Chevron. We established ART to combine our technology with that of Chevron and to develop, market and sell hydroprocessing catalysts to customers in the petroleum refining industry worldwide. We are a leading supplier of hydroprocessing catalysts designed for processing high resid content feedstocks. We offer products for fixed-bed resid hydrotreating, on-stream catalyst replacement and ebullating-bed resid hydrocracking processes. We also offer a full line of catalysts, customized for individual refiners, used in distillate hydrotreating to produce ultra-low sulfur content gasoline and diesel fuel, including our SMART CATALYST SYSTEM® and APART® catalyst systems. As discussed above, regulatory limitations on the sulfur content of gasoline and diesel fuel are becoming more common. These products are designed to help refiners to reduce the sulfur content of their products. We have rights to sell hydrocracking and lubes hydroprocessing catalysts to licensees of Chevron Lummus Global (CLG) and other petroleum refiners for unit refills. These rights allow us to streamline hydroprocessing catalyst supply and improve technical service for refining customers by establishing ART as their single point of contact for all their hydroprocessing catalyst needs. Competition in the hydroprocessing catalyst industry is based on value delivered to refiners, which is based on differentiated technology, catalyst performance, technical and customer service and price. Criterion, Albemarle, Haldor Topsoe, UOP and Axens are our leading global competitors in hydroprocessing catalysts. We also have multiple regional competitors. We are a leading provider of catalyst systems and catalyst supports to the polyolefins industry for a variety of polyethylene and polypropylene process technologies. These types of catalysts are used for the manufacture of polyethylene and polypropylene thermoplastic resins used in differentiated products such as plastic film, high-performance plastic pipe, automobile parts, household appliances, household containers, medical instruments, and many other end uses. We use a combination of proprietary catalyst and support technology and technology licensed from third parties to provide unique catalyst-based solutions to our customers and to provide a broad technology portfolio for enhancing collaboration opportunities with technology leaders. Our MAGNAPORE® polymerization catalyst is used to produce high performance polyethylene in the slurry loop process for pipe and film applications. We offer our LYNX® catalysts systems for the production of high-density polyethylene resins, such as bimodal film and pipe, as well as commercial use for the production of polypropylene in all major process technologies including slurry, bulk loop, stirred gas, fluid gas, and stirred bulk. Our CONSISTA® 6th generation, non-phthalate catalysts are used to produce polypropylene resins that exhibit enhanced clarity, stiffness, and impact strength. Our POLYTRAK® polymerization catalyst is designed to achieve improved polypropylene performance, particularly for impact resistant applications such as automobile bumpers and household appliances. Our standard and customized DAVICAT® catalysts offer a wide range of chemical and physical properties based on our material science technology for supported catalysts, polystyrene, herbicide, nutraceuticals and on-purpose olefins. Our RANEY® nickel, cobalt and copper hydrogenation and dehydrogenation catalysts are used for the synthesis of organic compounds for the fibers, polyurethanes, engineered plastics, pharmaceuticals, sweeteners and petroleum industries. The polyolefin catalyst and supports industry is technology-intensive, and suppliers must provide products formulated to meet customer specifications. There are many manufacturers of polyolefin catalysts and supports including Univation, LyondellBasell, Albemarle and PQ, and most sell their products worldwide. We are also a leading licensor of gas-phase polypropylene process technology to polypropylene manufacturers. Our UNIPOL® polypropylene technology is designed to have fewer moving parts and require less equipment than other competing technologies in order to reduce operating costs. This technology provides our licensees with a flexible and reliable capability to manufacture products for a broad array of end-use applications. The polypropylene process licensing industry is technology-intensive, and licensors must adapt the technology and the related licenses to meet individual customer needs. The major competing polypropylene process licensors are LyondellBasell and Lummus Novolen Technology. Our Catalysts Technologies products are manufactured by a network of globally coordinated plants. Our integrated planning organization is responsible for the effective utilization of our manufacturing capabilities. We use a global organization of technical professionals with extensive experience in refining processes, catalyst development, and catalyst applications to market our refining catalysts and additives. These professionals work to tailor our technology to the needs of each specific customer. We generally negotiate prices for our refining catalysts because our formulations are specific to the needs of each customer and each customer receives individual attention and technical service. We sell a significant portion of our hydroprocessing catalysts through multiple-year supply agreements with our geographically diverse customer base. We use a global direct sales force for our polyolefin catalysts, supports and technologies and chemical catalysts that seeks to maintain close working relationships with our customers. These relationships enable us to cooperate with major polymer and chemical producers to develop catalyst technologies that complement their process or application developments. We have geographically distributed our sales and technical service professionals to make them responsive to the needs of our geographically diverse customers. We typically operate under long-term contracts with our customers. prior to the shift in production by refineries from home heating oil for the winter season to gasoline production for the summer season. FCC catalysts and ebullating-bed hydroprocessing catalysts are consumed at a relatively steady rate and are replaced regularly. Fixed-bed hydroprocessing catalysts are consumed over a period of years and are replaced in bulk in an irregular pattern. Since our customers periodically shut down their refining processes to replace fixed-bed hydroprocessing catalysts in bulk, our hydroprocessing catalyst sales to any customer can vary substantially over the course of a year and between years based on that customer's catalyst replacement schedule. The principal raw materials for Catalysts Technologies products include molybdenum oxide, zeolite, caustic soda, sodium aluminate, sodium silicate, aluminum sulfate, nickel, alumina hydrate, alumina, aluminum metal, rare earths, and tungsten salt. Multiple suppliers are generally available for each of these materials; however, some of our raw materials may be provided by single sources of supply. We seek to mitigate the risk of using single source suppliers by identifying and qualifying alternative suppliers or, for unique materials, by using alternative formulations from other suppliers or by passing price increases on to customers. In some instances, we produce our own raw materials and intermediates. Prices for many of our raw materials, including metals, and energy can be volatile. In response to increases in raw material and energy costs, we generally take actions to mitigate the effect of higher costs including increasing prices, developing alternative formulations for our products, increasing productivity, and hedging purchases of certain raw materials. As in many chemical businesses, we consume significant quantities of natural gas in the production of Catalysts Technologies products. World events and other economic factors cause volatility in the price of natural gas. Increases or decreases in the cost of natural gas and raw materials can have a significant impact on our operating margins. We have implemented a risk management program under which we hedge natural gas in a way that is designed to provide protection against price volatility. Materials Technologies principally applies specialty silica, zeolite and fine chemical technologies in the design and manufacture of products to create significant value for our diverse customer base. Our customers include coatings manufacturers, consumer product manufacturers, plastics manufacturers, petrochemical and natural gas processors, and pharmaceutical companies. We believe that our technological expertise and broad technology platform provide a competitive advantage, allowing us to tailor our products to specific customer requirements and help them create value in their operations and end markets. The following table sets forth Materials Technologies sales of similar products as a percentage of Grace total revenue. In 2016, we exited certain product lines that accounted for approximately $35 million of Materials Technologies sales in 2015. The following table sets forth Materials Technologies sales by region as a percentage of Materials Technologies total revenue. meet evolving regulatory and environmental requirements. For example, our coatings additives are designed to be used in more sustainable water-based and VOC-compliant coatings. Our pharmaceutical excipients help improve bioavailability, extend shelf-life, and/or make drug manufacturing more efficient. Our dental silicas are engineered to provide high cleaning with gentle abrasivity. Our beer stabilization silicas offer greater productivity to breweries while reducing solid waste and water usage. Our custom manufacturing of advanced intermediates supports pharmaceutical drug development processes, enabling commercialization of life-saving therapies. Our products are used in a wide range of industries, including paint and coatings, pharmaceutical, food and beverage, personal care, plastics and rubber, and petrochemical and biofuels. We can modify the base silica and surface chemistry for our customers in order to enhance our product performance for their unique applications. Our global footprint allows us to partner effectively with both multinational and regional companies requiring multiple manufacturing facilities complemented by regional technical expertise in local languages. There are many manufacturers of engineered materials that market their products on a global basis including Evonik, PQ, and UOP. Competition is generally based on product performance, technical service, quality and reliability, price, and other differentiated product features to address the needs of customers, end-users and brand owners. Our products compete on the basis of distinct technology, product quality, and customer support. Competition for these products is highly fragmented, with a large number of companies that sell their products on a global or regional basis. Our Materials Technologies products are manufactured by a network of globally integrated plants that are positioned to service our customers regionally. Our integrated planning organization is responsible for the effective utilization of our manufacturing capabilities. We use country-based direct sales forces that are dedicated to each product line and backed by application-specific technical customer service teams to market our Materials Technologies products. Our sales force seeks to develop long-term relationships with our customers and focuses on consultative sales, technical support and key account growth programs. To ensure full geographic coverage, our direct sales organization is further supplemented by a network of distributors and agents. Seasonality does not have a significant overall effect on our Materials Technologies reportable segment; however, our adsorbents for dual frame windows are affected by seasonal and weather-related factors and the level of construction activity, and our edible oil refining agents, stabilizers and clarification aids for beer, juices and other beverages are affected by the level of consumption of beverages. These impacts are mitigated by the global scope of our business. The principal raw materials for Materials Technologies products include sodium silicate, zeolite, soda ash, sulfuric acid, and caustic soda. Multiple suppliers are generally available for each of these materials; however, some of our raw materials may be provided by single sources of supply. We seek to mitigate the risk of using single source suppliers by identifying and qualifying alternative suppliers or, for unique materials, by using alternative formulations from other suppliers or by passing price increases on to customers. In some instances, we produce our own raw materials and intermediates. Prices for many of our raw materials and energy can be volatile. In response to increases in raw material and energy costs, we generally take actions intended to mitigate the effect of higher costs including increasing prices, developing alternative formulations for our products, and increasing productivity. As in many chemical businesses, we consume significant quantities of natural gas in the production of Materials Technologies products. World events and other economic factors can cause volatility in the price of natural gas. Increases or decreases in the cost of natural gas and raw materials can have a significant impact on our operating margins. We have implemented a risk management program under which we hedge natural gas in a way that is intended to provide protection against price volatility. herein by reference. Disclosure of risks attendant to our foreign operations is provided in this Report in Item 1A (Risk Factors), which disclosure is incorporated herein by reference. While at any given time there may be some backlog of orders, this backlog is not material in respect to our total annual sales, nor are the changes, from time to time, significant. Competition in the specialty chemicals and specialty materials industry is often based on technological superiority and innovation. Our ability to maintain our margins and effectively compete with other suppliers depends on our ability to introduce new products based on innovative technology, as well as our ability to obtain patent or other intellectual property protection. Our research and development programs emphasize development of new products and processes, improvement of existing products and processes and application of existing products and processes to new industries and uses. Most research activity is conducted in North America and Europe. We routinely file and obtain patents in a number of countries around the world that are significant to our businesses in order to protect our investments in innovation, research, and product development. Numerous patents and patent applications protect our products, formulations, manufacturing processes, equipment, and improvements. We also benefit from the use of trade secret information, including know-how and other proprietary information relating to many of our products and processing technologies. There can be no assurance, however, that our patents, patent applications and precautions to protect trade secrets and know-how will provide sufficient protection for our intellectual property. In addition, other companies may independently develop technology that could replicate, and thus diminish the advantage provided by, our trade secrets. Other companies may also develop alternative technology or design-arounds that could circumvent our patents or may acquire patent rights applicable to our business which might interpose a limitation on expansion of our business in the future. Research and development expenses were approximately $54 million, $49 million, and $47 million in 2017, 2016, and 2015, respectively. These amounts include depreciation and amortization expenses related to research and development assets and expenses incurred in funding external research projects. The amount of research and development expenses relating to government- and customer-sponsored projects (rather than projects that we sponsor) was not material during these periods. Grace also conducts research and development activities with our ART joint venture, which are not included in the amounts above. We are subject, along with other manufacturers of specialty chemicals, to stringent regulations under numerous regional, national, provincial, state and local environment, health and safety laws and regulations relating to the manufacture, storage, handling, disposal and stewardship of chemicals and other materials. Environmental laws require that certain responsible parties, as defined in the relevant statute, fund remediation actions regardless of legality of original disposal or ownership of a disposal site. We are involved in various response actions to address the presence of chemical substances as required by applicable laws. Amounts are based on environmental response matters for which sufficient information is available to estimate costs. We do not have sufficient information to estimate all of Grace's possible future environmental response costs. As we receive new information, our estimate of such costs may change materially. Additional information about our environmental remediation activities is provided in this Report in Item 8 (Financial Statements and Supplementary Data) in the Financial Supplement under Note 10 (Commitments and Contingent Liabilities) to the Consolidated Financial Statements, which information is incorporated herein by reference. We continuously seek to improve our environment, health and safety performance. To the extent applicable, we extend the basic elements of the American Chemistry Council's RESPONSIBLE CARE® program to all our locations worldwide, embracing specific performance objectives in the key areas of management systems, product stewardship, employee health and safety, community awareness and emergency response, distribution, process safety and pollution prevention. We have implemented the RESPONSIBLE CARE® Security Code through a company-wide security program focused on the security of our people, processes, and systems. We have reviewed existing security (including cybersecurity) vulnerability and taken actions to enhance security systems where deemed necessary. In addition, we are complying with the Department of Homeland Security’s Chemical Facility Anti-Terrorism Standards, including identifying facilities subject to the standards, conducting security vulnerability assessments and developing site security plans, as necessary. As of December 31, 2017, we employed approximately 3,700 persons, of whom approximately 1,900 were employed in the United States and approximately 1,000 were employed in Germany. Of our total employees, approximately 2,200 were salaried and 1,500 were hourly. Approximately 640 of our manufacturing employees in the United States are represented by unions. We have operated without a labor work stoppage for more than 10 years. We have works councils representing the majority of our European sites serving approximately 1,100 employees. We maintain an Internet website at www.grace.com. Our annual reports on Form 10-K, quarterly reports on Form 10-Q, current reports on Form 8-K, and amendments to those reports, filed or furnished pursuant to Section 13(a) or 15(d) of the Securities Exchange Act of 1934, as amended, are available, free of charge, on our website as soon as reasonably practicable after such reports are electronically filed with, or furnished to, the Securities and Exchange Commission, or SEC. These reports may be accessed through our website's investor information page. In addition, the charters for the Audit, Compensation, Nominating and Governance, and Corporate Responsibility Committees of our Board of Directors, our corporate governance principles and code of ethics are available, free of charge, on our website at www.grace.com/en-us/corporate-leadership/pages/governance.aspx. Printed copies of the charters, governance principles and code of ethics may be obtained free of charge by contacting Grace Shareholder Services at 410-531-4167. The information on our website is not, and shall not be deemed to be, a part of this report or incorporated into any other filings we make with the SEC. Our Chief Executive Officer and Chief Financial Officer have submitted certifications to the SEC pursuant to the Sarbanes Oxley Act of 2002 as exhibits to this Report. See "Executive Officers of the Registrant" following Part I, Item 4 of this Report for information about our Executive Officers. The global scope of our operations subjects us to the risks of doing business in foreign countries, which could adversely affect our business, financial condition and results of operations. we are exposed to geopolitical risk, where unexpected changes in global, regional, or local political or social conditions could adversely affect our foreign operations. Our success as a global business will depend, in part, upon our ability to succeed in differing legal, regulatory, economic, social and political conditions by developing, implementing and maintaining policies and strategies that are effective in each location where we do business. We are exposed to currency exchange rate changes that impact our profitability. We are exposed to currency exchange rate risk through our U.S. and non-U.S. operations. Changes in currency exchange rates may materially affect our operating results. For example, changes in currency exchange rates may affect the relative prices at which we and our competitors sell products in the same region and the cost of materials used in our operations. A substantial portion of our net sales and assets are denominated in currencies other than the U.S. dollar, particularly the euro. When the U.S. dollar strengthens against other currencies, at a constant level of business, our reported sales, earnings, assets and liabilities are reduced because the non-U.S. currencies translate into fewer U.S. dollars. We incur a currency transaction risk whenever one of our operating subsidiaries enters into either a purchase or a sales transaction using a currency different from the operating subsidiary's functional currency. Given the volatility of exchange rates, we may not be able to manage our currency transaction risks effectively, or volatility in currency exchange rates may expose our financial condition or results of operations to a significant additional risk. Prices for certain raw materials and energy are volatile and can have a significant effect on our manufacturing and supply chain strategies as we seek to maximize our profitability. If we are unable to successfully adjust our strategies in response to volatile raw materials and energy prices, such volatility could have a negative effect on our earnings in future periods. We use petroleum-based materials, metals, natural gas and other materials in the manufacture of our products. We consume substantial amounts of energy in our manufacturing processes. Prices for these materials and energy are volatile and can have a significant effect on our pricing, sales, manufacturing and supply chain strategies as we seek to maximize our profitability. Our ability to successfully adjust strategies in response to volatile raw material and energy prices is a significant factor in maintaining or improving our profitability. If we are unable to successfully adjust our strategies in response to volatile prices, such volatility could have a negative effect on our sales and earnings in future periods. A substantial portion of our raw materials are commodities whose prices fluctuate as market supply and demand fundamentals change. limited use of financial instruments. Although we regularly assess our exposure to raw material price volatility, we cannot always predict the prospects of volatility and we cannot always cover the risk in a cost effective manner. We have a policy of maintaining, when available, multiple sources of supply for raw materials. However, certain of our raw materials may be provided by single sources of supply. We may not be able to obtain sufficient raw materials due to unforeseen developments that would cause an interruption in supply. Even if we have multiple sources of supply for raw materials, these sources may not make up for the loss of a major supplier. If we are not able to continue our technological innovation and successful introduction of new products, our customers may turn to other suppliers to meet their requirements. products. We may not be successful in developing new technology and products that effectively compete with products introduced by our competitors, and our customers may not accept, or may have lower demand for, our new products. If we fail to keep pace with evolving technological innovations or fail to improve our products in response to our customers’ needs, then our business, financial condition and results of operations could be adversely affected as a result of reduced sales of our products. We spend large amounts of money for environmental compliance in connection with our current and former operations. As a manufacturer of specialty chemicals and specialty materials, we are subject to stringent regulations under numerous U.S. federal, state, local and foreign environmental, health and safety laws and regulations relating to the generation, storage, handling, discharge, disposition and stewardship of chemicals and other materials. We have expended substantial funds to comply with such laws and regulations and have established a policy to minimize our emissions to the environment. Nevertheless, legislative, regulatory and economic uncertainties (including existing and potential laws and regulations pertaining to climate change) make it difficult for us to project future spending for these purposes, and if there is an acceleration in new regulatory requirements, we may be required to expend substantial additional funds to remain in compliance. We are subject to environmental clean-up costs, fines, penalties and damage claims that have been and continue to be costly. In the U.S., we are subject to lawsuits and regulatory actions, in connection with current and former operations (including some divested businesses and off-site disposal facilities), that seek clean-up or other remedies. We are also subject to similar risks outside of the U.S.
We operated a vermiculite mine in Libby, Montana, until 1990. Some of the vermiculite ore that was mined at the Libby mine contained naturally occurring asbestos. We are cooperating with the U.S. Environmental Protection Agency and other federal, state and local governmental agencies in a remedial investigation and feasibility study ("RI/FS") of the Libby mine and the surrounding area to determine the location, scope and extent of required remediation. The EPA is also investigating or remediating formerly owned or operated sites that processed Libby vermiculite into finished products. We are cooperating with the EPA on these investigation and remediation activities, and have recorded a liability to the extent that our review has indicated that a probable liability has been incurred and the cost is estimable. We have recorded liabilities for all environmental matters for which a loss is considered to be probable and sufficient information is available to reasonably estimate the loss. These liabilities do not include the cost to remediate the Libby vermiculite mine and surrounding area or costs related to any additional EPA claims, whether resulting from the EPA's investigation of vermiculite facilities or otherwise, which may be material but are not currently estimable. Due to these vermiculite-related matters, it is probable that our ultimate liability for environmental matters will exceed our current estimates by material amounts. Our indebtedness may materially affect our business, including our ability to fulfill our obligations, react to changes in our business and incur additional debt to fund future needs. limit our ability to borrow additional funds, or to dispose of assets to raise funds, if needed, for working capital, capital expenditures, acquisitions, research and development and other purposes. If we incur additional debt, the risks related to our indebtedness may intensify. We expect to incur additional debt in connection with the announced polyolefin catalysts acquisition. Restrictions imposed by agreements governing our indebtedness may limit our ability to operate our business, finance our future operations or capital needs, or engage in other business activities. If we fail to comply with certain restrictions under these agreements, our debt could be accelerated and we may not have sufficient cash to pay our accelerated debt. consolidate, merge or sell all or substantially all of our assets or the assets of our guarantors. As a result of these covenants, we will be limited in the manner in which we can conduct our business, and may be unable to engage in favorable business activities or finance future operations or capital needs. Accordingly, these restrictions may limit our flexibility to operate our business. A failure to comply with the restrictions contained in these agreements, including maintaining the financial ratios required by our credit facilities, could lead to an event of default which could result in an acceleration of our indebtedness. We cannot assure you that our future operating results will be sufficient to enable us to comply with the covenants contained in the agreements governing our indebtedness or to remedy any such default. In addition, in the event of an acceleration, we may not have or be able to obtain sufficient funds to make any accelerated payments. Our indebtedness exposes us to interest expense increases if interest rates increase. As of December 31, 2017, $301.3 million, or approximately 20%, of our borrowings were at variable interest rates and expose us to interest rate risk. If interest rates increase, our debt service obligations on the variable rate indebtedness would increase even though the amount borrowed would remain the same, and our net income would decrease. An increase of 100 basis points in the interest rates payable on our variable rate indebtedness would increase our annual estimated debt-service requirements by $3.0 million, assuming our consolidated variable interest rate indebtedness outstanding as of December 31, 2017, remains the same. We have unfunded and underfunded pension plan liabilities. We will require future operating cash flow to fund these liabilities. We have no assurance that we will generate sufficient cash to satisfy these obligations. We maintain U.S. and non-U.S. defined benefit pension plans covering current and former employees who meet or met age and service requirements. Our net pension liability and cost is materially affected by the discount rate used to measure pension obligations, the longevity and actuarial profile of our workforce, the level of plan assets available to fund those obligations and the actual and expected long-term rate of return on plan assets. Significant changes in investment performance or a change in the portfolio mix of invested assets can result in corresponding increases and decreases in the valuation of plan assets or in a change in the expected rate of return on plan assets. Assets available to fund the pension benefit obligation of the U.S. advance-funded pension plans at December 31, 2017, were approximately $1,110 million, or approximately $107 million less than the measured pension benefit obligation on a U.S. GAAP basis. In addition, any changes in the discount rate could result in a significant increase or decrease in the valuation of pension obligations, affecting the reported funded status of our pension plans as well as the net periodic pension cost in the following years. Similarly, changes in the expected return on plan assets can result in significant changes in the net periodic pension cost in the following years. Our obligation to make payments to the PD Trust in respect of asbestos PD Claims (other than ZAI PD Claims) is not capped and we may be obligated to make additional payments. our former ZAI attic insulation product. Unresolved and future non-ZAI PD Claims are to be litigated pursuant to procedures approved by the Bankruptcy Court and, to the extent such PD claims are determined to be allowed claims, are to be paid in cash by the PD Trust. We are obligated to make a payment to the PD Trust every six months in the amount of any non-ZAI PD Claims allowed during the preceding six months plus interest (if any) and the amount of PD Trust expenses for the preceding six months (the "PD Obligation"). The aggregate amount we are required to pay under the PD Obligation is not capped so we may have to make additional payments to the PD Account in respect of the PD Obligation. We are also obligated to make up to 10 contingent deferred payments to the PD Trust of $8 million each during the 20-year period beginning February 3, 2019, in respect of ZAI PD Claims in the event the ZAI PD Account's assets fall below $10 million in the preceding year. We have accrued liabilities for probable PD Claims but have not accrued any liability for the contingent ZAI PD payments as we do not currently believe they are probable. Our ability to use net operating losses and tax credits to reduce future tax payments may be limited if there is a change in ownership of Grace or if Grace does not generate sufficient U.S. taxable income or foreign source income. Our ability to use these attributes is also subject to time limitations. Changes in tax laws and regulations may reduce their value and availability. Our ability to use future tax deductions and tax credits, including net operating losses ("NOLs"), is dependent on our ability to generate sufficient future taxable income in the U.S. and sufficient foreign source income. Under U.S. federal income tax law, a corporation is generally permitted to carry forward NOLs for a 20-year period (indefinitely in the case of NOLs occurring in taxable years after December 31, 2017) for deduction against future taxable income. Federal tax credits may be carried forward for 10 years. Also, our ability to use NOLs and tax credits and their value may be adversely affected by changes in tax laws and regulations. In addition, our ability to utilize federal and state NOLs and U.S. federal tax credits may be limited by Section 382 of the Internal Revenue Code resulting from future changes in the ownership of outstanding Company common stock. Our Amended and Restated Certificate of Incorporation provides that under certain circumstances, our Board of Directors would have the authority to impose restrictions on the transfer of Company common stock with respect to certain 5% stockholders in order to preserve these future tax benefits. We intend to pursue acquisitions, joint ventures and other transactions that complement or expand our businesses. We may not be able to complete proposed transactions and even if completed, the transactions may involve a number of risks that may materially and adversely affect our business, financial condition and results of operations. our possible inability to achieve the intended objectives of the transaction. In addition, we may not be able to successfully or profitably integrate, operate, maintain and manage any newly acquired operations or their employees. We may not be able to maintain uniform standards, controls, procedures and policies, which may lead to operational inefficiencies. We work with dangerous materials that can injure our employees, damage our facilities, disrupt our operations, and contaminate the environment. Some of our operations involve the handling of hazardous materials that may pose the risk of fire, explosion, or the release of hazardous substances. Such events could result from natural disasters, operational failures or terrorist attacks, and might cause injury or loss of life to our employees and others, environmental contamination, and property damage. These events might cause a temporary shutdown of an affected plant, or portion thereof, and we could be subject to penalties or claims as a result. A disruption of our operations caused by these or other events could have a material adverse effect on our results of operations. Some of our employees are unionized, represented by works councils or employed subject to local laws that are less favorable to employers than the laws in the United States. As of December 31, 2017, we had approximately 3,700 global employees. Approximately 640 of our approximately 1,900 U.S. employees are unionized. In addition, a large number of our employees are employed in countries in which employment laws provide greater bargaining or other rights to employees than the laws in the United States. Such employment rights require us to work collaboratively with the legal representatives of the employees to effect any changes to labor arrangements. For example, most of our employees in Europe are represented by works councils that have co-determination rights on any changes in conditions of employment, including certain salaries and benefits and staff changes, and may impede efforts to restructure our workforce. A strike, work stoppage or slowdown by our employees or significant dispute with our employees, whether or not related to these negotiations, could result in a significant disruption of our operations or higher ongoing labor costs. We may be subject to claims of infringement of the intellectual property rights of others, which could hurt our business. From time to time, we face infringement claims from our competitors or others alleging that our processes or products infringe on their proprietary technologies. Any claims that our products or processes infringe the intellectual property rights of others, regardless of the merit or resolution of the claims, could cause us to incur significant costs in responding to, defending and resolving the claims, and may divert the efforts and attention of our management and technical personnel from our business. If we are found to be infringing on the proprietary technology of others, we may be liable for damages, and we may be required to change our processes, redesign our products, pay others to use the technology or stop using the technology or producing the infringing product. Even if we ultimately prevail, the existence of the lawsuit could prompt our customers to switch to products that are not the subject of infringement suits. We are subject to business continuity risks that may adversely affect our business, financial condition and results of operations. We are subject to significant risks from both natural disasters and accidents such as fires, storms and floods, and other disruptive events, such as war, insurrection and terrorist actions. These types of occurrences can negatively affect our manufacturing, supply chain, logistics, transportation, and communications functions. Similarly, they can strike major suppliers and customers, thus restricting or delaying our supply of raw materials or energy as well as reducing or deferring demand for our products and services. Also, we have centralized certain administrative functions, primarily in North America, Europe and Asia, to improve efficiency and reduce costs. To the extent that these central locations are disrupted or disabled, key business processes, such as invoicing, payments and general management operations, could be interrupted. As we operate worldwide in a competitive environment, global economic and financial market conditions may adversely affect our business, financial condition and results of operations. We compete by selling value-added products, technologies and services. Increased levels and numbers of competitors, globally or regionally, could negatively impact our results of operations. Economic conditions around the world can have a direct impact on our revenues. A global or regional economic downturn or market uncertainty could reduce the demand for our products, technologies and services, which could negatively impact our results of operations. Since many of our customers are refiners, our fluid catalytic cracking (FCC) catalyst business is highly dependent on the economics of the petroleum refining industry. Demand for our FCC products is affected by refinery throughput, the type and quality of refinery feedstocks, and the demand for transportation fuels and other refinery products, such as propylene. Also, disruptions in the financial markets could have an adverse effect on our ability to finance our operations and growth plans, and could negatively impact our suppliers and customers in similar manners. Our ability to operate our businesses and our financial condition could be significantly undermined by cybersecurity breaches. business information, which could be used by unauthorized parties and publicly disclosed. This could negatively affect our relationships with customers and our ability to compete effectively, and could ultimately harm our reputation, business, financial condition and results of operations. In addition, we may be required to incur significant costs to protect against damage caused by cybersecurity breaches in the future. We rely upon the capacity, reliability and security of our IT infrastructure and our ability to expand and continually update this infrastructure in response to the changing needs of our business. If we experience a problem with the functioning of an important IT system, the resulting disruptions could have an adverse effect on our business. Our IT systems affect virtually every aspect of our business, including supply chain, manufacturing, logistics, finance and communications. We and certain of our third-party vendors receive and store personal information in connection with our human resources operations and other aspects of our business. Any IT system failure, natural disaster, accident, or intentional breach could result in disruptions to our operations. In connection with the Separation, GCP will indemnify us and we will indemnify GCP for certain liabilities. There can be no assurance that the indemnities from GCP will be sufficient to insure us against the full amount of such liabilities, or that GCP’s ability to satisfy its indemnification obligation will not be impaired in the future. Pursuant to the Separation and Distribution Agreement and other agreements we entered into in connection with the Separation, GCP agreed to indemnify us for certain liabilities, and we agreed to indemnify GCP for certain liabilities. However, third parties might seek to hold us responsible for liabilities that GCP agreed to assume or retain under these agreements, and there can be no assurance that GCP will be able to fully satisfy its indemnification obligations under these agreements. A court could deem the Distribution in the Separation to be a fraudulent conveyance and void the transaction or impose substantial liabilities upon us. If the transaction is challenged by a third party, notwithstanding the fact that we received an opinion from a nationally recognized financial firm that we were solvent and had adequate surplus to make the Distribution, a court could deem the distribution of GCP common stock or certain internal restructuring transactions undertaken by us in connection with the Separation to be a fraudulent conveyance or transfer. Fraudulent conveyances or transfers are defined to include transfers made or obligations incurred with the actual intent to hinder, delay or defraud current or future creditors or transfers made or obligations incurred for less than reasonably equivalent value when the debtor was insolvent, or that rendered the debtor insolvent, inadequately capitalized or unable to pay its debts as they become due. In such circumstances, a court could void the transactions or impose substantial liabilities upon us, which could adversely affect our financial condition and our results of operations. Among other things, the court could require our stockholders to return to us some or all of the shares of GCP common stock issued in the Distribution or require us to fund liabilities of other companies involved in the Separation for the benefit of creditors. Whether a transaction is a fraudulent conveyance or transfer will vary depending upon the laws of the applicable jurisdiction. Shared facilities are counted in both reportable segments. The total number of facilities included in the above table, without regard to sharing between reportable segments, is 20, of which we owned 11 and leased 9. Generally, we own the machinery and equipment at our principal manufacturing plants. We also own the land on which most of our largest manufacturing plants are situated; however, certain manufacturing plants are located on leased land, normally long-term. We own our Corporate Headquarters in Columbia, Maryland. We also lease and operate a shared services facility in Manila, Philippines. The table below sets forth our principal manufacturing plants by reportable segment. For information on our net properties and equipment by region and country, see disclosure set forth in Item 8 (Financial Statements and Supplementary Data) in the Financial Supplement under Note 17 (Segment Information) to our Consolidated Financial Statements, which disclosure is incorporated herein by reference. In connection with our credit agreement, we executed security agreements with respect to certain of our United States facilities. As of December 31, 2017, mortgages or deeds of trust were in effect with respect to facilities in the following locations: Albany, Oregon; Curtis Bay and Columbia, Maryland; Chicago, Illinois; and Lake Charles, Louisiana. For a description of our credit agreement see Item 8 (Financial Statements and Supplementary Data) in the Financial Supplement under Note 5 (Debt) to the Consolidated Financial Statements. Disclosures provided in this Report in Item 1 (Business) and Item 8 (Financial Statements and Supplementary Data), and in the Financial Supplement under Note 10 (Commitments and Contingent Liabilities, under the caption "Legacy Product and Environmental Liabilities") to the Consolidated Financial Statements, are incorporated herein by reference. Disclosures provided in this Report in Item 1 (Business) under the caption "Environment, Health and Safety Matters" and Item 8 (Financial Statements and Supplementary Data), and in the Financial Supplement under Note 10 (Commitments and Contingent Liabilities, under the caption "Legacy Environmental Liabilities") to the Consolidated Financial Statements, are incorporated herein by reference. Information concerning mine safety violations or other regulatory matters required by Section 1503(a) of the Dodd-Frank Wall Street Reform and Consumer Protection Act and Item 104 of Regulation S-K (17 CFR 229.104) is included in Exhibit 95 to this Report. Pursuant to General Instruction G(3) of Form 10-K, the following list of executive officers of Grace as of February 15, 2018, is included as an unnumbered Item in Part I of this report in lieu of being included in the Grace Proxy Statement relating to the Annual Meeting of Stockholders to be held on May 9, 2018. Our executive officers are elected annually. Messrs. Festa, La Force and Shelnitz have been actively engaged in Grace's business for the past five years. Mr. Blaser joined Grace in 2016. Mr. Blaser was most recently during 2015 President of Arysta LifeScience North America, LLC, a global agricultural chemical and life science business where he also served for ten years as Chief Financial Officer. Ms. Brown joined Grace in 2015. From 2010 until she joined Grace, Ms. Brown held leadership positions in human resources for Tyco International Limited (now Johnson Controls, Inc.). Mr. Cole joined Grace in 2014. From 2002 until he joined Grace, Mr. Cole held leadership positions in government relations and public policy for General Motors Corporation. Except as provided below, the disclosure required by this Item appears in this Report in: Item 6 (Selected Financial Data); under the heading "Selected Financial Data" opposite the caption "Other Statistics—Common shareholders of record" in the Financial Supplement; Item 8 (Financial Statements and Supplementary Information) in the Financial Supplement in Note 14 (Shareholders' Equity) and Note 21 (Quarterly Summary and Statistical Information (Unaudited) opposite the captions "Dividends declared per share" and "Market price of common stock") to the Consolidated Financial Statements; and Item 12 (Security Ownership of Certain Beneficial Owners and Management and Related Stockholder Matters), and such disclosure is incorporated herein by reference. 10 business days (or a later date fixed by the Board of Directors) after an acquiring person commences (or announces the intention to commence) a tender offer or exchange offer for beneficial ownership of 20% or more of the outstanding Company common stock. Until these events occur, the rights will automatically trade with the Company common stock, and separate certificates for the rights will not be distributed. The rights do not have voting or dividend rights. may be exchanged by Grace for one share of Company common stock or one hundredth of a share of Company junior preferred stock, subject to adjustment. Generally, if there is an acquiring person and we are acquired, each right not owned by an acquiring person will entitle the holder to buy a number of shares of common stock of the acquiring company having a market value equal to twice the exercise price of the right. Each share of Company junior preferred stock will be entitled to a minimum preferential quarterly dividend payment of $1.00 per share but will be entitled to an aggregate dividend equal to 100 times the dividend declared per share of Company common stock whenever such dividend is declared. In the event of liquidation, holders of Company junior preferred stock will be entitled to a minimum preferential liquidation payment of $100 per share but will be entitled to an aggregate payment equal to 100 times the payment made per share of Company common stock. Each share of Company junior preferred stock will have 100 votes, voting together with the Company common stock. Finally, in the event of any business combination, each share of Company junior preferred stock will be entitled to receive an amount equal to 100 times the amount received per share of Company common stock. These rights are protected by customary antidilution provisions. The rights will expire on March 30, 2018.
dividend at an initial annual rate of $0.68 per share of Company common stock. On February 8, 2017, we announced that our Board of Directors approved an increase to the annual cash dividend rate, raising it to $0.84 per share of Company common stock. On February 8, 2018, we announced that the Board of Directors approved a further increase to the annual cash dividend rate, raising it to $0.96 per share of Company common stock. Although our credit agreement and indentures (as described in Item 8 (Financial Statements and Supplementary Data) in the Financial Supplement under Note 5 (Debt) to the Consolidated Financial Statements and filed as an exhibit to this Report) contain certain restrictions on the payment of dividends on, and redemptions of, equity interests and other restricted payments, we believe that such restrictions do not currently materially limit our ability to pay dividends. Any determination to pay cash dividends in the future may be affected by business and market conditions, our views on potential future capital requirements, the restrictions noted above, covenants contained in any agreements we may enter into in the future and changes in federal income tax law. On February 5, 2015, we announced that the Board of Directors authorized a share repurchase program of up to $500 million, which we completed on July 10, 2017. On February 8, 2017, we announced that the Board of Directors authorized an additional share repurchase program of up to $250 million. Repurchases under the programs may be made through one or more open market transactions at prevailing market prices; unsolicited or solicited privately negotiated transactions; accelerated share repurchase programs; or through any combination of the foregoing, or in such other manner as determined by management. The timing of the repurchases and the actual amount repurchased will depend on a variety of factors, including the market price of Grace's shares, the strategic deployment of capital, and general market and economic conditions. The following table presents information regarding the status of repurchases of Company common stock by or on behalf of Grace or any "affiliated purchaser" of Grace. Neither Grace nor any such affiliated purchaser of Grace purchased any shares of Company common stock during the three months ended December 31, 2017. As of February 3, 2014, the effective date of the Grace Joint Plan of Reorganization, we issued to the WRG Personal Injury Trust warrants (the "PI Warrant") to acquire 10 million shares of Company common stock at a price of $17 per share. On February 3, 2015, we repurchased the PI Warrant for a payment of $490 million. Under the terms of our Amended and Restated Certificate of Incorporation, as approved by the Bankruptcy Court as part of the confirmation of the Joint Plan, in order to preserve significant tax benefits which are subject to elimination or limitation, the Board of Directors has the authority to impose restrictions on the transfer of Company common stock with respect to certain 5% shareholders. Imposing such restrictions requires at least a 25% ownership shift to occur (as determined under Internal Revenue Code regulations) and at least a two-thirds vote of all of the directors. These restrictions would generally not limit the ability of a person that holds less than 5% of Company common stock to either buy or sell stock on the open market. This summary does not purport to be complete and is qualified in its entirety by reference to the Amended and Restated Certificate of Incorporation, which has been filed with the SEC and is incorporated by reference as Exhibit 3.1 to this Annual Report on Form 10-K. The following information in Item 5 is not deemed to be "soliciting material" or to be "filed" with the SEC or subject to Regulation 14A or 14C under the Securities Exchange Act of 1934, as amended (the "Exchange Act") or to the liabilities of Section 18 of the Exchange Act, and will not be deemed to be incorporated by reference into any filing under the Securities Act of 1933, as amended, or the Exchange Act, except to the extent Grace specifically incorporates it by reference into such a filing. The line graph and table below compare the cumulative total shareholder return on Company common stock with the cumulative total return of companies on the Standard & Poor’s ("S&P") 500 Stock Index, the S&P Composite 1500 Specialty Chemicals Index and S&P 1500 Diversified Chemicals Index. 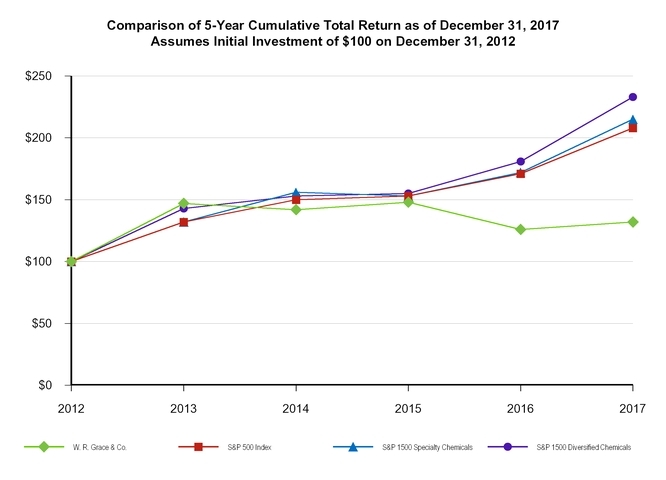 This graph and table assume the investment of $100 in Company common stock on December 31, 2012. Cash dividends paid in 2016 and 2017 are assumed reinvested for the graph and table below. The disclosure required by this Item appears in the Financial Supplement under the heading "Selected Financial Data" which disclosure is incorporated herein by reference. The disclosure required by this Item appears in the Financial Supplement under the heading "Management's Discussion and Analysis of Financial Condition and Results of Operations" which disclosure is incorporated herein by reference. Our global operations, raw materials and energy requirements, and debt obligations expose us to various market risks. We use derivative financial instruments to mitigate certain of these risks. The following is a discussion of our primary market risk exposures, how those exposures are managed, and certain quantitative data pertaining to our market risk-sensitive instruments. We operate and/or sell to customers in over 60 countries and in over 30 currencies; therefore, our results of operations are exposed to changes in currency exchange rates. We seek to minimize exposure to these changes by matching revenue streams in volatile currencies with expenditures in the same currencies, but it is not always possible to do so. From time to time, we use financial instruments such as currency forward contracts, options, or combinations of them to reduce the risk of certain specific transactions. However, we do not have a policy of hedging all exposures, because management does not believe that such a level of hedging would be cost-effective. Significant uses of derivatives to mitigate the effects of changes in currency exchange rates are as follows. In May 2016, Grace entered into a fixed-to-fixed cross-currency swap maturing in October 2021 to hedge its net investment in non-U.S. subsidiaries. On every April 1 and October 1, Grace will swap interest payments. Grace will pay euro fixed at the annual rate of 3.426% on €170.0 million and receive U.S. dollars fixed at the annual rate of 5.125% on $190.3 million. The agreement requires an exchange of the notional amounts at maturity. The following tables provide information about the cross-currency swap at December 31, 2017, specifically, the aggregate future cash flows for each of the next four years and the fair value. The fair value represents the value of the derivative contract, and is included in "other current assets" and "other liabilities" in the Consolidated Balance Sheets. There were no significant currency forward exchange agreements outstanding at December 31, 2017. As of December 31, 2017, approximately $301.3 million of our borrowings were at variable interest rates and expose us to interest rate risk. As a result, we have been and will continue to be subject to the variations on interest rates in respect of our floating-rate debt. A 100 basis point increase in the interest rates payable on our variable rate debt outstanding as of December 31, 2017, would increase our annual interest expense by $3.0 million. In connection with our emergence financing, we entered into an interest rate swap beginning on February 3, 2015, and maturing on February 3, 2020, fixing the LIBOR component of the interest on $250 million of Grace's term debt at a rate of 2.393%. While we have and may continue to enter into agreements intending to limit our exposure to higher interest rates, any such agreements may not offer complete protection from this risk. See Item 8 (Financial Statements and Supplementary Data) in the Financial Supplement under Note 6 (Fair Value Measurements and Risk) to the Consolidated Financial Statements for additional disclosure around market risk, which disclosure is incorporated herein by reference. The disclosure required by this Item appears in the Financial Supplement which disclosure is incorporated herein by reference. Except as provided below, the disclosure required by this Item appears in the Financial Supplement under the headings "Management's Report on Financial Information and Internal Controls" and "Report of Independent Registered Public Accounting Firm," which disclosure is incorporated herein by reference. There was no change in Grace's internal control over financial reporting during the quarter ended December 31, 2017, that has materially affected, or is reasonably likely to materially affect, Grace's internal control over financial reporting. Incorporated by reference to the sections entitled "Proposal One: Election of Directors," "—Nominees for Election as Directors," "—Continuing Directors," and "—Corporate Governance;" "Questions and Answers About the Annual Meeting and the Voting Process—Question 29: Where can I find Grace corporate governance materials? ;" and "Other Information—Section 16(a) Beneficial Ownership Reporting Compliance" of a definitive proxy statement that Grace will file with the SEC no later than 120 days after December 31, 2017 (the "2018 Proxy Statement"). Required information on executive officers of Grace appears at Part I after Item 4 of this report. Incorporated by reference to the sections entitled "Proposal One: Election of Directors—Corporate Governance," and "—Director Compensation," and "Executive Compensation" of the 2018 Proxy Statement. Incorporated by reference to the sections entitled "Other Information—Stock Ownership of Certain Beneficial Owners and Management" and "—Equity Compensation Plan Information" of the 2018 Proxy Statement. Incorporated by reference to the sections entitled "Proposal One: Election of Directors—Corporate Governance" and "Other Information—Related Party Transactions" of the 2018 Proxy Statement. Incorporated by reference to the sections entitled "Proposal Two: Ratification of the Appointment of Independent Registered Public Accounting Firm—Principal Accountant Fees and Services" and "—Audit Committee Pre-Approval Policies and Procedures" of the 2018 Proxy Statement. Financial Statements and Schedules. The required information is set forth in the Financial Supplement under the heading "Table of Contents" which is incorporated herein by reference. Exhibits. The exhibits to this Report are listed below. Other than exhibits that are filed herewith, all exhibits listed below are incorporated by reference. were made only as of the date of the applicable agreement or such other date or dates as may be specified in the agreement and do not reflect more recent developments. Accordingly, these representations and warranties may not describe the actual state of affairs as of the date they were made or at any other time. Additional information about Grace may be found elsewhere in this report and Grace's other public filings, which are available without charge through the Securities and Exchange Commission's website at http://www.sec.gov. Joint Plan of Reorganization of W. R. Grace & Co. and its Debtor Subsidiaries. Order Confirming Joint Plan of Reorganization. Separation and Distribution Agreement, dated as of January 27, 2016, by and among W. R. Grace & Co., W. R. Grace & Co.–Conn. and GCP Applied Technologies Inc. Amended and Restated Sale and Purchase Agreement, dated as of February 21, 2018, by and between Albemarle Corporation and W. R. Grace & Co.–Conn. Amended and Restated Rights Agreement, dated as of March 25, 2008, between W. R. Grace & Co. and Mellon Investor Services LLC, as Rights Agent. Receivables Purchase Agreement, dated as of January 23, 2007, between Grace GmbH & Co. KG and Coface Finanz GmbH. Credit Agreement, dated as of February 3, 2014, by and among W. R. Grace & Co., W. R. Grace & Co.-Conn., Grace GmbH & Co. KG, a Federal Republic of Germany limited partnership, each lender from time to time party thereto, and Goldman Sachs Bank USA, as Administrative Agent. First Amendment and Consent to Credit Agreement and First Amendment to Security Agreement, dated as of November 25, 2015, by and among W. R. Grace & Co., W. R. Grace & Co.–Conn., Grace GmbH & Co. KG, Alltech Associates, Inc., each lender from time to time party thereto, and Goldman Sachs Bank USA, as Administrative Agent and lender. Deferred Payment Agreement (PD), dated as of February 3, 2014, by and between W. R. Grace & Co.–Conn. and the WRG Asbestos PD Trust. Guarantee Agreement (PD), dated as of February 3, 2014, by and between W. R. Grace & Co. and the WRG Asbestos PD Trust. Deferred Payment Agreement (PD-ZAI), dated as of February 3, 2014, by and between W. R. Grace & Co.–Conn. and the WRG Asbestos PD Trust. Guarantee Agreement (PD-ZAI), dated as of February 3, 2014, by and between W. R. Grace & Co. and the WRG Asbestos PD Trust. Share Issuance Agreement, dated as of February 3, 2014, by and among W. R. Grace & Co., the WRG Asbestos PD Trust and the WRG Asbestos PI Trust. Indenture, dated as of September 16, 2014, by and among W. R. Grace & Co.–Conn., the guarantors party there to and Wilmington Trust, National Association, as trustee. First Supplemental Indenture, dated as of September 16, 2014, by and among W. R. Grace & Co.–Conn., the guarantors party thereto and Wilmington Trust, National Association, as trustee. Form of 5.125% Note due 2021 (included as Exhibit A-1 to Exhibit 4.11). Form of 5.625% Note due 2024 (included as Exhibit A-2 to Exhibit 4.11). WRG Asbestos Property Damage Settlement Trust Agreement, dated as of February 3, 2014, by and between W. R. Grace & Co., the Asbestos PD Future Claimants’ Representative, the Official Committee of Asbestos Property Damage Claimants, the Asbestos PD Trustees, Wilmington Trust Company, and the members of the Zonolite Attic Insulation Trust Advisory Committee. W. R. Grace & Co. Amended and Restated 2011 Stock Incentive Plan. W. R. Grace & Co. 2014 Stock Incentive Plan. Form of Performance-based Unit Agreement (2016). Form of Stock Option Award Agreement (2016). Form of Restricted Stock Award Agreement (2016). W. R. Grace & Co. Supplemental Executive Retirement Plan, as amended. W. R. Grace & Co. Executive Salary Protection Plan, as amended. Form of Executive Change in Control Severance Agreement between Grace and certain officers. Severance Plan for Leadership Team Officers of W. R. Grace & Co.
2015 Executive Annual Incentive Compensation Plan. Tax Sharing Agreement, dated as of January 27, 2016, by and among W. R. Grace & Co., W. R. Grace & Co.–Conn. and GCP Applied Technologies Inc.
Letter Agreement dated May 27, 2009, between John F. Akers, on behalf of Grace, and Fred Festa (includes indemnification and arbitration provisions). Letter Agreement dated February 28, 2008, between Fred Festa, on behalf of Grace, and Hudson La Force III (includes indemnification provision). Letter Agreement dated November 13, 2013, between Fred Festa, on behalf of Grace, and Keith N. Cole (includes indemnification provision). Letter Agreement dated December 3, 2014, between Fred Festa, on behalf of Grace, and Elizabeth C. Brown (includes indemnification provision). Accepted Letter dated January 21, 2016, between Fred Festa, on behalf of Grace, and Thomas E. Blaser (includes indemnification provision). Computation of Ratio of Earnings to Fixed Charges and Combined Fixed Charges and Preferred Stock Dividends. List of Subsidiaries of W. R. Grace & Co.
Certification of Periodic Report by Chief Executive Officer under Section 302 of the Sarbanes-Oxley Act of 2002. Certification of Periodic Report by Chief Financial Officer under Section 302 of the Sarbanes-Oxley Act of 2002. Certification of Periodic Report by Chief Executive Officer and Chief Financial Officer under Section 906 of the Sarbanes-Oxley Act of 2002. Management contracts and compensatory plans, contracts or arrangements required to be filed as exhibits to this Report. Pursuant to the requirements of the Securities Exchange Act of 1934, this Report has been signed below by the following persons on behalf of the registrant and in the capacities indicated on February 22, 2018. By signing his name hereto, Mark A. Shelnitz is signing this document on behalf of each of the persons indicated above pursuant to powers of attorney duly executed by such persons and filed with the Securities and Exchange Commission. The Financial Statement Schedule should be read in conjunction with the Consolidated Financial Statements and Notes thereto. Financial statements of less than majority-owned persons and other persons accounted for by the equity method have been omitted as provided in Rule 3-09 of the United States Securities and Exchange Commission's (the "SEC") Regulation S-X. Financial Statement Schedules not included have been omitted because they are not applicable or the required information is shown in the Consolidated Financial Statements or Notes thereto. Responsibility For Financial Information—We are responsible for the preparation, accuracy, integrity and objectivity of the Consolidated Financial Statements and the other financial information included in this report. Such information has been prepared in conformity with accounting principles generally accepted in the United States of America and accordingly, includes certain amounts that represent management's best estimates and judgments. Actual amounts could differ from those estimates. Responsibility For Internal Controls—We and our management are also responsible for establishing and maintaining adequate internal controls over financial reporting. These internal controls consist of policies and procedures that are designed to assess and monitor the effectiveness of the control environment including risk identification, governance structure, delegations of authority, information flow, communications and control activities. A chartered Disclosure Committee oversees Grace's public financial reporting process and key managers are required to confirm their compliance with Grace's policies and internal controls quarterly. While no system of internal controls can ensure elimination of all errors and irregularities, Grace's internal controls, which are reviewed and modified in response to changing conditions, have been designed to provide reasonable assurance that assets are safeguarded, policies and procedures are followed, transactions are properly executed and reported, and appropriate disclosures are made. The concept of reasonable assurance is based on the recognition that there are limitations in all systems of internal control and that the costs of such systems should be balanced with their benefits. The Audit Committee of the Board of Directors, which is composed solely of independent directors, meets regularly with Grace's senior financial management, internal auditors and independent registered public accounting firm to review audit plans and results, as well as the actions taken by management in discharging its responsibilities for accounting, financial reporting and internal controls. The Audit Committee is responsible for the selection and compensation of the independent registered public accounting firm. Grace's financial management, internal auditors and independent registered public accounting firm have direct and confidential access to the Audit Committee at all times. Report On Internal Control Over Financial Reporting—We and our management have evaluated Grace's internal control over financial reporting as of December 31, 2017. This evaluation was based on criteria for effective internal control over financial reporting set forth in Internal Control—Integrated Framework (2013) issued by the Committee of Sponsoring Organizations of the Treadway Commission. Based on this evaluation, we and our management have concluded that Grace's internal control over financial reporting is effective as of December 31, 2017. Grace's independent registered public accounting firm that audited our financial statements included in Item 15 has also audited the effectiveness of Grace's internal control over financial reporting as of December 31, 2017, as stated in their report, which appears on the following page. Report On Disclosure Controls And Procedures—As of December 31, 2017, we and our management carried out an evaluation of the effectiveness of the design and operation of Grace's disclosure controls and procedures pursuant to Rule 13a-15 under the Securities Exchange Act of 1934, as amended (the "Exchange Act"). Based upon that evaluation, we concluded that Grace's disclosure controls and procedures are effective in ensuring that information required to be disclosed in Grace's periodic filings and submissions under the Exchange Act is accumulated and communicated to us and our management to allow timely decisions regarding required disclosures, and such information is recorded, processed, summarized and reported within the time periods specified in the Securities and Exchange Commission's rules and forms. We have audited the accompanying consolidated balance sheets of W. R. Grace & Co. and its subsidiaries (“the Company”) as of December 31, 2017 and December 31, 2016, and the related consolidated statements of operations, of comprehensive income, of equity, and of cash flows for each of the three years in the period ended December 31, 2017, including the related notes and schedule of valuation and qualifying accounts and reserves for each of the three years in the period ended December 31, 2017 appearing under Item 15 (collectively referred to as the “consolidated financial statements”). We also have audited the Company's internal control over financial reporting as of December 31, 2017, based on criteria established in Internal Control - Integrated Framework (2013) issued by the Committee of Sponsoring Organizations of the Treadway Commission (COSO). In our opinion, the consolidated financial statements referred to above present fairly, in all material respects, the financial position of the Company as of December 31, 2017 and December 31, 2016, and the results of their operations and their cash flows for each of the three years in the period ended December 31, 2017 in conformity with accounting principles generally accepted in the United States of America. Also in our opinion, the Company maintained, in all material respects, effective internal control over financial reporting as of December 31, 2017, based on criteria established in Internal Control - Integrated Framework (2013) issued by the COSO. The Company's management is responsible for these consolidated financial statements, for maintaining effective internal control over financial reporting, and for its assessment of the effectiveness of internal control over financial reporting, included in the accompanying Management’s Report on Financial Information and Internal Controls. Our responsibility is to express opinions on the Company’s consolidated financial statements and on the Company's internal control over financial reporting based on our audits. We are a public accounting firm registered with the Public Company Accounting Oversight Board (United States) ("PCAOB") and are required to be independent with respect to the Company in accordance with the U.S. federal securities laws and the applicable rules and regulations of the Securities and Exchange Commission and the PCAOB. reasonable assurance regarding prevention or timely detection of unauthorized acquisition, use, or disposition of the company’s assets that could have a material effect on the financial statements. We have served as the Company’s auditor since 1906. We hereby consent to the incorporation by reference in the Registration Statements on Form S‑8 (Nos. 333-194171, 333-173785) of W. R. Grace & Co. of our report dated February 22, 2018 relating to the financial statements, financial statement schedule, and the effectiveness of internal control over financial reporting, which appears in this Form 10‑K.